Fully lined drapery measures 100" wide (two 50"wide panels) and offered in lengths of 63", 84", 96" and 108". Valance is sold separately. 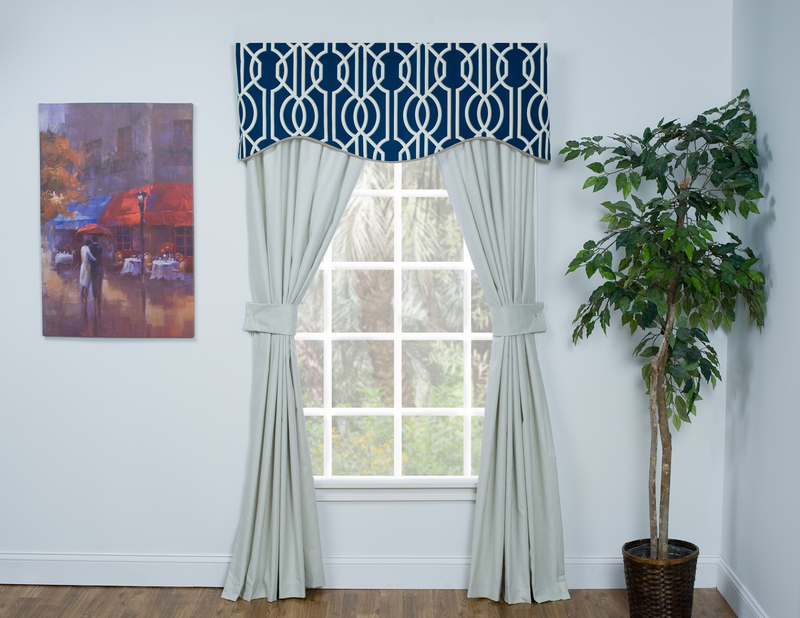 Andros Shaped Valance features main print on comforter and is fully lined in white lining material. 3" rod pocket. Use a 2 1/2" continental rod for hanging. 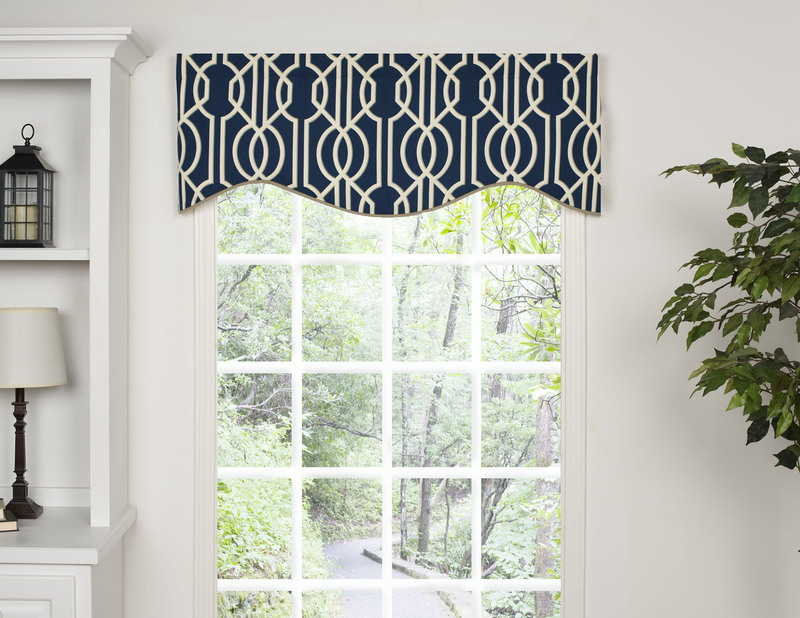 This window valance is designed to lay flat, therefore, measure the width of your curtain rod and add for projection on both sides for a proper fit. 3" rod pocket: use a 2 1/2" continental rod for hanging. 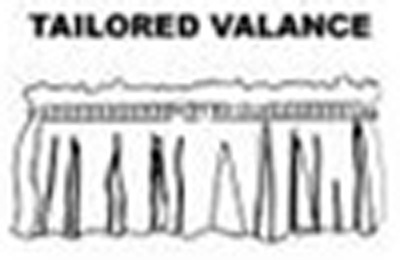 Valance is fully lined in high quality white lining material. For proper fit, please allow approximately two times the width of your window. Give your décor a modern update with the Andros by Victor Mill collection from The Curtain Shop. 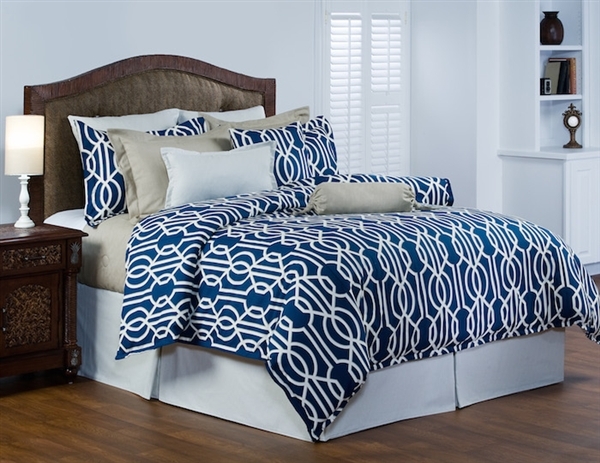 The Andros comforter set features navy blue fabric covered in a white, chain-like geometric design. The lovely contemporary design on high-quality, 100 percent cotton fabric will show off your chic sense of style while making your bedroom cozier than ever. The Victor Mill comforter sets are available from The Curtain Shop in two different packages. The first basic option includes one comforter, one bed skirt and one or two pillow shams, depending on the size. The second, more complete option includes all of the same pieces plus extra Euro shams and three decorative pillows. The comforter sets come in Twin, Full, Queen, King and California King sizes. Bed skirts are available in 15-, 18- and 21-inch drops to accommodate most box spring sizes. In addition to full comforter sets, the Andros collection by Victor Mill features window treatments, shower curtains and fabric by the yard for custom projects. Choose from rod pocket drapes, shaped valances and tailored valances to complete your decorating project with ease.